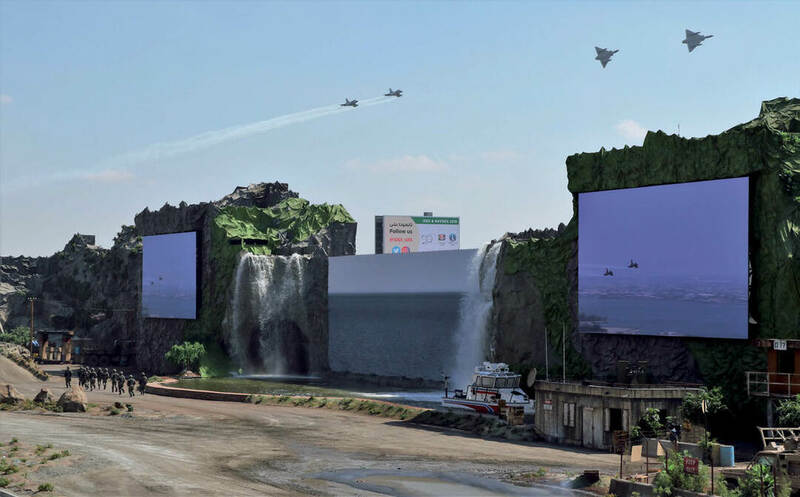 Packed with movie grade special effects, pyrotechnics and working waterfalls, the blockbuster style performance took place in a 60m x 350m custom stage set built over a car park overlooked by a grandstand in Abu Dhabi. 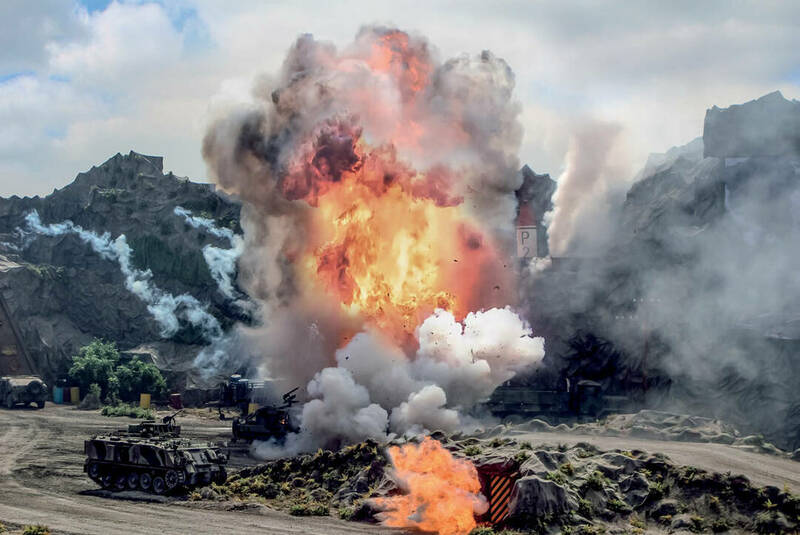 Protec delivered everything from the initial creative concept and narrative to the original set design, graphics, build, complete show delivery and coordination completely transporting the audience to an active ‘war zone’ where the story takes place. 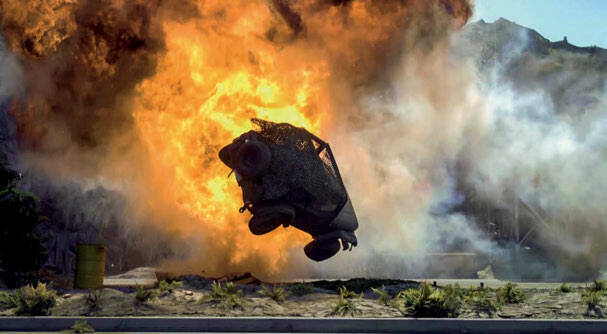 tying in with explosions and firefights on land and sea? SETTING THE SCENE The show began with a mix of local heritage performances followed by local and international military parades to welcome the crowd before the main part of the show. 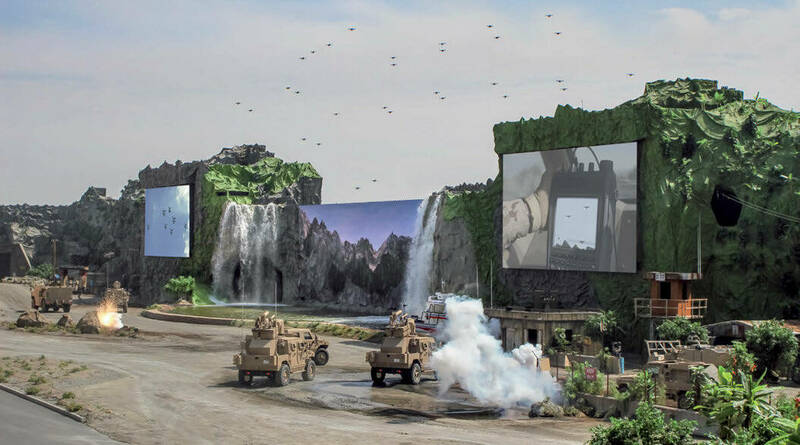 The scene was set for an exciting battle enactment of a fictitious scenario where an elite military group representing the Land Forces, Special Forces, Navy and Air Force were deployed in a coordinated and synchronised manner to deal with rebel militia. up for the show for all five days this show was run. In the fictional scenario conceptualised by Protec, armed militias had seized an abandoned military base near a mine depot, smuggling arms by sea and through a hidden underground network of tunnels connected to a long range missile facility. 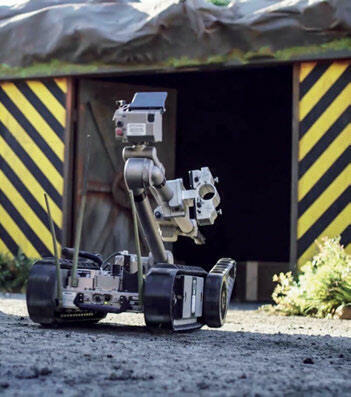 A combination of ground, naval, air and other specialised units equipped with futuristic counter defence systems were then deployed to deal with the threat. 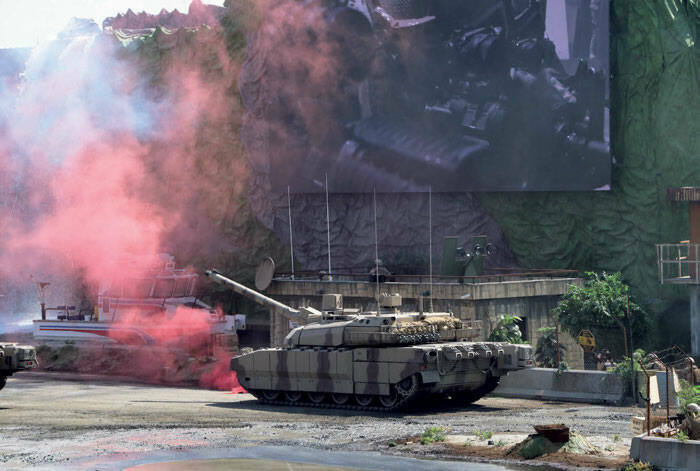 THE CLIMAX Tanks and armoured patrol vehicles repeatedly roared onto the stage from both sides carefully choreographed to create nail biting suspense. 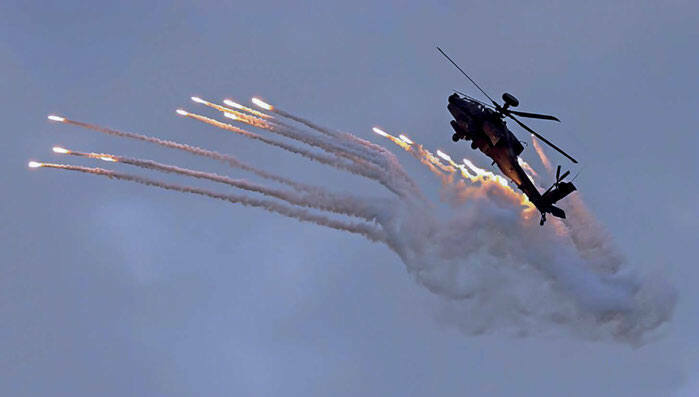 Apaches, Blackhawks and jets screamed overhead sending vibrations through the crowd while the battle was even taken underground into the mine tunnels taking the audience on a vicarious journey into the future of warfare. 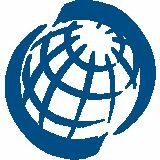 advanced systems and techniques augmented by virtual reality, artificial intelligence, robotics, unmanned systems and satellite communications to locate and monitor militia movement. The friendly forces eventually seize control of the situation after fierce firefights on ground, at sea, in the air and underground to bring stability and security to the area. the Chechen Republic leader Ramzan Kadyrov, Tatarstan President Rustam Minnikhanov and Bangladesh Prime Minister Sheikh Hasina. Also in attendance were Crown Princes of all the emirates, defence ministers and senior military officers from over 100 nations, head of delegates (heads of state) and other senior officials. 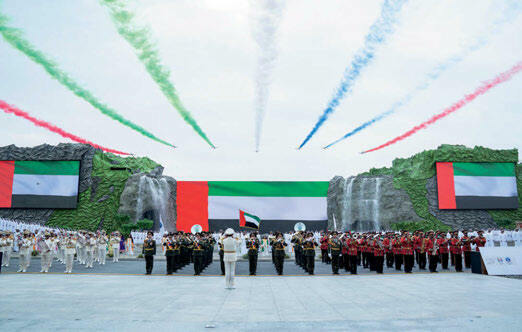 This influential audience were treated to a breathtaking, all-action display that highlighted the capabilities of many divisions of the UAE Armed Forces. Protec’s founder and CEO, Stephen Lakin, who was in charge of building the entire scenic set along with Project Manager Pieter Smuts said, “Under the temporary venue that Protec built, were the exhibition centre’s utilities and drainage systems which had to be protected by the weight of the military vehicles, some which weighed in excess of 60 tonnes. Therefore it had to be built up to 1m above the existing surface, graded up with sand and road base”, said Lakin. Protec also built a temporary 60m long x 30m wide x 1m high ‘water inlet’ which held 2million litres of water on which jet boats were run to get involved in the action. Protec’s staging department built all the supporting features and props. A working replica of a ship that was seen on the video screens during the show as part of a VT was built and was used in the water feature as part of the action. The vessel, built in Protec’s Dubai facility was built with steel frames and timber and had cabin for six crew in it. 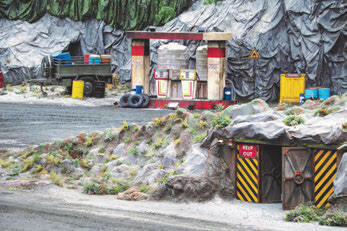 The department also designed and built some of the futuristic counter defence props, a motorised ‘ballistic missile’, all the scenic structures and entrance features. It was also ably supported by the painting department that made it all look very realistic with extremely detailed finishing. 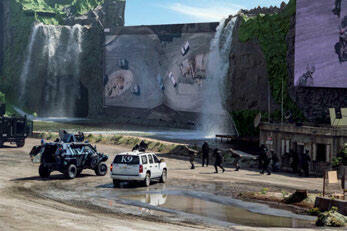 behind them and a 30m x 10m LED screen was built between the two upstage structures. These screens showed a combination of live camera and pre-filled filmed edits and animations to support the show. ADNEC had this to added: “When it comes to putting on an elaborate and eye catching event, we couldn’t have been in more capable hands than those of the Protec Team. 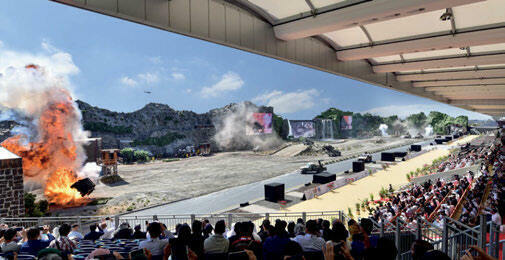 We at ADNEC can confirm, that for IDEX’s Silver Jubilee Opening Ceremony, we were not disappointed.